CPS are the sole Authorised Systems Builder of FlexLink conveyor systems in Ireland. FlexLink has conveyor systems to handle, divert, rotate, push, or accumulate products during the manufacturing process. With FlexLink, you gain enhanced production efficiency from our conveyor systems, process expertise, and advanced software. FlexLink conveyors are durable, practically maintenance free and offer huge reliability benefits to our customers. 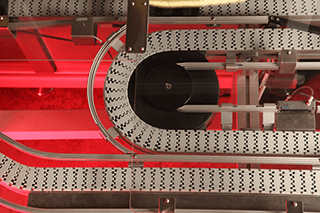 The Flexlink conveyors are based on an aluminium conveyor beam with low friction slide rails guiding a plastic multi-flexing chain. Products to be conveyed travel directly on the Flexlink conveyor, or on pallets or carriers. The proven virtual maintenance free qualities of FlexLink mean that in 24 hour 7 day week operations, production is kept at maximum efficiencies. Products that are handled have a weight from a few grams up to 30 kg and up to 1400 kg using roller and belt conveyors. The Flexlink chain design permits horizontal as well as vertical change of direction. The Flexlink alpine conveyor differs from the common FlexLink conveyor in the way that the alpine is built in a compact spiral configuration. The common use of the Flexlink alpine conveyor is as an accumulation/buffer zone between machines. Or, as an in-process step, used in cooling or drying, or simply for elevation and loweration, for example. The use of vertical buffering for a leading packaging supplier allows dynamic storage and retrieval of product when up-stream packaging machinery needs filling. This allows a defined amount of buffering to occur without stopping the filling machine. Once the packaging machine is back up, the product on the buffer is reversed and the product is introduced back onto the line in a controlled manner. FlexLink’s wedge conveyor concept provides fast gentle handling of a range of varying size and shape products. The system, through quick manual adjustments is capable of handling some 460 products.